jara ládano, L. Cistaceae, Eng. 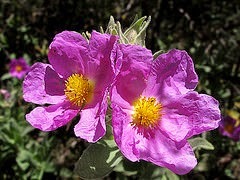 sweet rockrose. These are shrubs bearing five-petal solitary nectar flowers that are very similar to roses. They bloom in Spain in July. As natives to the Mediterranean, they grow withstanding poor soil and resisting heat and drought. Two species contain laudanum or labdanum, which are Cistes creticus (eastern Mediterranean) and landaniferus (western Mediterranean) (Sp. ládano, Ar. arlādan, Pers ladan), a sweet smelling, sticky, aromatic oil used in perfumery, fumigation or incense and thought good for colds. It was used for medicinal purposes, a a pain-killer or sedative. labdanum collecting device and thought they gathered it. Actually, for this job billy goats come in handy. While they munch on the plant, the oil sticks to their beards. When they finished grazing the beards were combed with a rake-like leather instrument. This ancient traditional method is only practiced in Crete today. Spain, the largest producer, boils the twigs and leaves and then skim off the resin. In Crete the beards are cut annually and the oil extracted, i.e. those that the pharaohs did not keep for themselves. They glued the goatees to their chins in order to smell good and that is how the word for this type of beard came into being. The other goatees were heated, which released the oils. Labdanum came to substitute ambergris, a waxy substance found in the intestine of sperm whales, and is used in the perfume trade. The application of labdanum instead of ambergris was so successful that Crete and Cypress were exporting 10,000 lbs. per year by 1870. In Al-Andalus rockrose seed bread became popular after Abderraman III of Cordova discovered it in the mountains of north Africa when invading the region. He must have brought it back to Spain or introduced its use in southern Spain. According to Avenzoar, this bread is harmful to health and not recommended in any way but it is still prepared by inhabitants of the Ketama Mountains in northern Morocco. The seeds contain feculent or starchy material. In July, bees gather nectar there to make rockrose honey.